VATICAN CITY (CNS) — The family is under attack now more than ever because of today’s culture of division that wants to break from and be free of all everlasting bonds and forms of solidarity, Pope Francis said. “Talking about problems of the family, for example, bonds are being destroyed, instead of created. Why? Because we are living in a culture of the provisional, of conflict, of the inability to make alliances,” he said. What is needed is a church and Christians who are willing to “waste time” on people, not just principles, and accompany face-to-face those needing to discover the truth in Jesus Christ, he said. The pope’s comments came during a 90-minute encounter with about 8,000 lay members of the international Schonstatt movement Oct. 25 in the Vatican audience hall. The movement, founded by the late German Father Joseph Kentenich, was celebrating its 100th anniversary. Representatives asked the pope five questions, ranging from how to help strengthen families to his secret for maintaining a sense of hope and happiness in such a trouble-plagued world. “I haven’t got the faintest idea,” he said with a smile. Part of it comes from his personality and being a bit “impulsive,” which makes him a bit of a daredevil, he said. But that courage is also rooted in prayer and abandoning himself to God’s goodness, he added. Knowing that God is always there, even “in moments of major sin,” gives him great confidence and faith, he said, in remarks that were entirely unscripted. Something else that helps, he said, is perspective. Jesus Christ is and must always be at the center of everything, which means, oneself, one’s parish, the associations one belongs to, even the Roman Curia, cannot become the center of one’s life, he said. “The truth is grasped better from the periphery,” from the outside looking in, he said. One striking example came to light in a recent conversation with a criminal defense lawyer who told him he often cries with the prisoners he visits in jail. “He sees the world of law, of what he has to judge as a criminal lawyer, but also from the wounds that he finds there,” which allows him to see the actual situation better, the pope said. “Therefore, I would say a healthy recklessness — that is, letting God do things; praying and abandoning oneself; courage and patience; and going to the peripheries. I don’t know if this is my secret, but it is what comes to mind,” he said. The family is “beaten and the family is bastardized” and debased, since almost anything is being called a family, he said. The family faces a crisis “because it is being bludgeoned by all sides, leaving it very wounded,” he said. There is no other choice than to go to the family’s aid and give them personal help, he said. However, people must also be accompanied “and this also means wasting time. The greatest master of wasting time is Jesus. 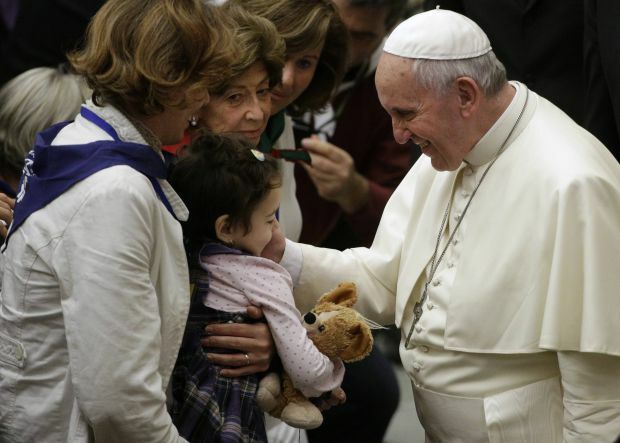 He wasted time accompanying, to help consciences mature, to heal the wounds, to teach,” the pope said. He said the sacrament of matrimony is becoming just a ceremony or social event for some people, who do not see its sacramental nature as a union with God. Part of the problem is a lack of formation for engaged couples and “this is a sin of omission on our part,” he said. When asked about the best way to share the faith with others, the pope said going out into the world and living as true witnesses of Christ and his message is the only way. “There is no other way. To live in a way that others become interested and ask, ‘Why?’ This is witness,” he said. Missionaries don’t save people; they are “transmitters of someone that saves us,” which is possible only if people have made Jesus a full part and the heart of their lives. Everyone, however, is weak, makes mistakes, has problems “and we don’t always give a good witness; but the ability to become humble inside, to ask for forgiveness when our witness is not what it should be,” this is part of being good Christians.